The need for Financial Inclusion is fast emerging as an international policy issue at the macro level. The Financial Inclusion Imperative and Sustainable Approaches is a comprehensive account of various components of the Financial Inclusion. It presents a blueprint to combat poverty and highlights the critical role of banks and the microfinance sector. This book is comprehensive and gives a contemporary treatment of major issues facing the Indian Economy today. It combines academic rigor and objectivity with clear presentation. In this incisive book, the author asks searching questions and offers carefully thought-out answers. This book will be a valuable source of reference on the subject for bankers, policy-makers, teachers and students of economics. Financial exclusion broadly relates to a lack of access to a range of financial services. Several of those who belong to the lower income groups are unable to access mainstream financial products such as bank accounts and bank loans. This financial exclusion imposes real costs on them and their families' implications become graver when they prompt social exclusion and lock families in a cycle of perpetuity of debt, poverty and exclusion. An inclusive financial sector per contra, is one which offers a range of financial services to the entire population of a country and addresses issues of economic growth with equity. The RBI as the Central Bank has always been engaged with building a legal and regulatory environment for the financial sector which broadens access to its services. The processes of globalisation and faster economic growth have spurred the need for affirmative action for inclusive growth and to build social safety nets through increasing financial inclusion. Growth with equity has been the overriding policy concern which has governed the direction of banking policies. In India, in the context of initiatives exercised for extension of the penetrative outreach of the banking sector, the mode of financial sector development discussed in the previous chapters too has been characterised by the following features. Financial inclusion was sought to be achieved through an increase in bank branches which led to an expanded cooperative network and new organisational forms like regional rural banks. This book is concerned with the increasingly important and problematic area of financial inclusion. Financial inclusion is defined as the process of ensuring access to financial services and timely and adequate credit where needed by vulnerable groups such as weaker sections and low income groups at affordable cost. There is a growing concern even in the developed economies that while liberalisation improves financial products and services for the few, it simultaneously accentuates denial of services for others. There is a huge unmet demand for financial services. The poor are left with no alternative but to rely on informal credit providers and access finance at higher rates. Even when banking services are available, the high cost of accessing these services makes them prohibitive for the poor. Also, non-price barriers such as proof of identity are very difficult to surmount for shifting or migratory population. 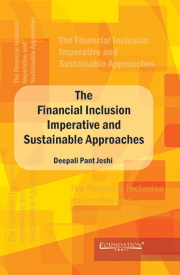 This book shows how financial inclusion is viewed as a policy priority even in developed countries. The author provides interesting illustrations of international experience among others about the Financial Inclusion Task Force of the United Kingdom and the Community Reinvestment Act of the United States. In France, there is a law on exclusion of 1998 which emphasises the mandatory right to a bank account. In South Africa a low cost bank account “Msanzi” has been launched for the financially excluded. In India, initiatives for financial inclusion have come from the government and the RBI at the level of macro policy and have been translated into initiatives by banks. In order to address the issues of financial inclusion, the Government of India constituted a ‘Committee on Financial Inclusion’ under the Chairmanship of Dr C. Rangarajan. The Committee submitted its final report to Union Finance Minister on 4 January 2008. (iii) reviewing the international experience in implementing policies for financial inclusion and to examine their relevance applicability to India. (iii) a monitoring mechanism to assess the quality and quantum of financial inclusion including indicators for assessing progress. To suggest measures to extend the reach of the financial sector to such vulnerable groups by minimizing, if not eliminating the formal and informal barriers to access encountered by such groups. In the report that Dr Rangarajan submitted, it was maintained that access to finance by the poor and vulnerable groups is a prerequisite for poverty reduction and social cohesion. In developed countries, there is a greater awareness of the positive role financial inclusion can play in empowering the low income groups. Official policies in these countries actively promote inclusive practices, going as far as to give them statutory sanction. In UK, a dedicated fund has been set up to encourage inclusion, and banks and credit unions have been assigned definite responsibilities. In the US, the Community Reinvestment Act prohibits discrimination by banks against low- and moderate-income groups, while in France, it is a legal right for anyone to have a bank account. Clearly, there is much to learn both from international developments and from the experience gained within the country during the first two decades after bank nationalisation. Building inclusive financial systems and allowing access to them is a goal that is relevant to economies at all levels of development. The primary objective lies in making financial systems available to all and ensuring that as many people as possible enjoy access to the financial system, thereby tapping the full potential of the economy. Attention needs to be devoted to enhancing the quality, reach and range of financial services and products credit, savings, insurance payment systems for sustained growth and productivity. It is axiomatic that well-functioning financial systems boost economic growth which reduces poverty. Financial market imperfections as high transaction costs flowing from asymmetry of information are addressed by wellfunctioning financial systems. All countries need to improve financial access. Targetted programmes to address the multidimensional nature of poverty. The multitude of programmes has, in recent years, been strengthened through the National Rural Employment Guarantee Scheme (NREGS). In a country with sharp regional inequalities in development and levels of living, the centre has a role in redistribution of financial resources to enable the poorer states to provide basic public services at a reasonably comparable level. In this chapter we discuss the poverty estimates, turn our attention to the methods of poverty analysis and analyse the impact of programmes initiated to combat poverty and exclusion and suggest a broader framework required to reduce, if not eliminate, these two major scourges. Development is a value-laden issue demanding explicit ethical analysis. Debates on development have for long been viewed in reductionist economic terms. From a policy perspective, economic development can be defined as efforts that seek to improve the economic well-being and quality of life for a community. This is achieved by creating and retaining jobs and supporting or growing incomes and the tax base. There are significant differences between ‘economic growth’ and ‘economic development’. The term ‘economic growth’ refers to the increase (or growth) of a specific measure such as real national income, gross domestic product, or per capita income. National income or product is commonly expressed in terms of a measure of the aggregate value-added output of the domestic economy termed gross domestic product (GDP). When the GDP of a nation rises, economists refer to it as ‘economic growth’. The term ‘economic development’ on the other hand, implies much more. It typically refers to improvements in a variety of indicators such as literacy rates, life expectancy and poverty rates. GDP is a specific measure of economic welfare that does not take into account important aspects such as leisure time, environmental quality, freedom, or social justice. Economic growth of any particular measure is not a sufficient indicator of economic development. The contemporary social scientific study of economic development encompasses, inter alia, broad theories of the causes of industrial economic modernisation plus organisational and related aspects of enterprise development in modern societies. Financial inclusion is one of the biggest challenges in the world of economics. It is enabling the delivery of banking services at an affordable cost to the vast sections of disadvantaged and low income groups. Unrestrained access to public goods and services is the sin qua non of an open and efficient society. Banking services are essentially for welfare of the public. It is imperative that the availability of banking and payment services to the entire populace without discrimination should be the prime objective of public policy. Thus, banking is perceived as a public good. Financial inclusion has positive externalities: it leads to increase in savings, investment and thereby spurs the processes of economic growth. When 69 per cent of the people are beyond the pale of the formal financial system, their savings remain untapped and their credit needs remain unfulfilled. In the specific Indian context, financial savings of the household sector have been declining from 48.2 per cent in 2000–01 to 46.7 per cent in 2004–05 commensurably. There has been an increase in physical savings from 51.2 per cent to 53.3 per cent during the same period. One plausible reason could be the lack of banking/financial services which would encourage savings in many places. The extent of bank branch expansion reflects the extent of availability of financial services through mainstream providers. Interestingly, there has been a decline in the number of rural branches of banks; as per available data, there were 32,562 branches in rural areas during 2001, i.e. 49.4 per cent. With decades of rapid growth behind us, and very positive prospects ahead, India is enjoying an unprecedented position of influence in the global economy. The years ahead should be years of growth and opportunity that will enable us, as important members of the global community of nations to make further progress in the struggle against poverty and move towards the attainment of the Millennium Development Goals. The challenge of extending India's growing prosperity to the poorest sections of society remains pressing and immediate. Without a significant increase in investment, the region will fall short of achieving several millennium development goals, particularly with regard to health, water supply, and sanitation, primary education and the environment. Financial inclusion starts with the vision that the poor are bankable and experience has shown that poor people can be enabled to have access to credit and other financial services, the services when effectively used by them will enhance their contribution to the economy. These can be delivered in a financially sustainable way. Much has been done and much remains to be done. What is important is that by recognising this we seize the opportunity to take on the many arduous challenges that remain and forge ahead. This is critical. We have concluded that growth, per se, is not enough. We have to broaden the base of growth and through the processes of financial inclusion, we have to address the problems of poverty by redirecting our investments and development efforts towards the poor to promote equity with efficiency. While the international studies on poverty have been rich and abundant, theoretical and empirical studies have been made on the subject of measuring poverty and targeting the poor for income transfer programmes. Several other strands that deal with specific sets of measures to either protect or promote the poor have also emerged. The growing interest in microfinance as a strategy for poverty alleviation is a case in point. There is a need to identify the key impediments in providing microfinance services to the poor and the necessity of a framework for scaling up the services rendered by various organisations to the poor and the unorganised sector. Introduction of the right incentives and removal of distortions would undoubtedly enable the sector to fulfil its developmental obligations, specifically the enhancement of accessibility of financial services to the poor. While the World Bank has estimated the annual demand for credit support from the 75 million poor households at Rs 450 billion, the extent to which this demand is satisfied by the formal banking sector and by the MFIS has not been ascertained. Several micro level studies however indicate that the poor still continue to depend on informal sources of credit and these sources account for 40 per cent to 60 per cent of household demand. The challenge for mainstream banking institutions and the microfinance sector is how to bridge the gap. The emergence of microfinance brings into sharper focus the need to provide appropriate delivery mechanisms for financial services and the poor are willing to pay for door delivery of reliable financial services. With the adoption of Five Year planning in post-Independence India, a new era set in to develop the ‘weaker sections’ of the people of the country by emphasizing education, community development and tribal upliftment. This became forceful in 1957 with Nehru's ground-breaking idea of panchsheel, where he spoke about tribal protection encompassing ethno-cultural preservation, land rights, equality and freedom. Ever since, the Indian government has been trying to bring the marginalized sections of society into the mainstream by initiating various tribal development plans and programmes, and also through its ‘reservations’ policy, which marks steps towards ‘positive discriminations’. Through such positive discrimination, certain number of places are reserved for scheduled tribes in public services and in higher education. Governments at both the state and the central levels in India have special Tribal Sub Plan programmes which inject substantial financial resources into tribal upliftment. In this regard, in Northeast India, Government policies were oriented towards the preservation of its rich ethno-cultural identity while introducing modern economic mechanisms for development. ‘Special provisions were made under the Sixth Schedule to the Constitution for the administration of the tribal areas. The scheme of the administration was almost wholly based on the North East Frontier Tribal and Excluded Areas Sub-Committee of the Constitution Assembly. The scheme conceived an autonomous administration in these areas so that the tribal people may continue to follow their traditional way of life with such changes as they themselves may like to introduce’. Perpetual growth retardation as seen in Chapter 2 has kept Northeast India outside the mainstream economy of India. Disparity across Indian States has widened and this cluster of states remains at the periphery of the country's economy. To understand the reasons for this, one needs to probe into the role of those sectors whose effective functioning has been crucial to the economy of these states. One such is the government sector. This chapter attempts to examine the role of the government and its financial arrangements, and its relationship with economic activities in Northeast India since Independence. Barro and Sala-i-Martin feel that the government can affect the economic growth rates in a number of ways. The volume of consumption, spending, level of taxation, distortion of international trade and political instability, are the negative influences of governmental intervention. Positive influences include maintaining and enhancing existing institutions, developing financial institutions and spending on public infrastructure. Government policy and economic growth are inextricably linked, and government functioning and policy do affect the growth of an economic entity. Therefore, the relationship between government policies and growth becomes a priority area for economic research, and the present chapter is a case study on the role of government finances in the Northeast region's economic development. It is time to find out the reasons why the economic performance of the region has remained so poor.